The blue face discus is a rare strain of discus. It resembles the snakeskin discus but has a blue face with a unique body pattern. The blue face discus is related to the wild caught heckel discus but it is not a wild caught fish. 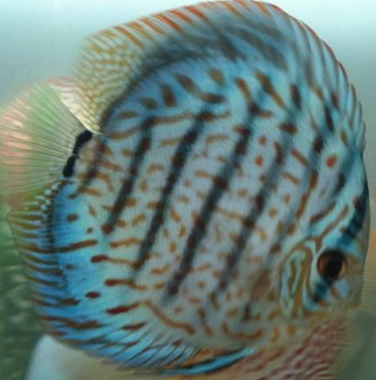 This fish is a cross between a blue turquoise discus and a heckel discus gene. Like all other domestic discus fish the blue face is a schooling fish. therefore it is recommended that you keep it discus groups of at least 6 discus. Like all domestic discus the blue face prefers warmer water in the temperature of 84-86F degrees. The blue face diet requires high protein discus flakes, pellets, beef heart flakes, blood worms and black worms. This is a must have discus for the true discus fanatic.